A ways back I blogged about Jamie Oliver's latest show, Ministry of Food, in which he tries to teach a British town of 250,000 how to cook by teaching his recipes to a few folks, asking them to teach them to a few folks and so on, and so on. 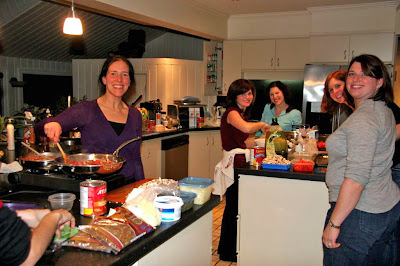 My wife, inspired by Jamie's social experiment, decided to host one of her own whereby she's organized a group of her friends to share their families' favourite recipes. "So Yoni and I just finished watching Ministry of Food with Jamie Oliver. We would each be responsible for providing a list of ingredients needed for the recipe ahead of time and would bring it along, or the hostess could pick it all up and then divide the cost of the groceries amongst participants. Let me know if you’re interested! (Can you tell I’m getting bored with our usual repertoire of meals?)." Well today I'm pleased to report that the idea was a big hit whereby she and 6 of her friends met at our house and made a chicken curry dish that has proven to be surprisingly child and picky-eater friendly (Recipe Below). They've also already set a date for their next culinary adventure. Maybe it's time for you and your friends to "Pass it On"? Heat oil in large skillet over medium-high heat. Add onions to the pan and cook until softened. Add the garlic, chiles, coriander, turmeric, cumin, ginger, paprika, red pepper flakes, and mustard seeds and cook gently for 2 min, stirring constantly. Add the tomatoes and lemon juice and mix well. Puree half of the tomato-onion mixture in a blender or food processor or in the pan with a handheld immersion blender. In layers add to the slow cooker one-third of the Chicken (dark meat first) and one quarter of the sauce, and sprinkle with one-third of the cauliflower. Repeat the layers two more times and finish with the remainder of the sauce. Turn the cooker to Low and cook for 4-4.5 hours. During the last 30 minutes, toss in the peas, season with salt, cover and cook until tender. Per Serving (excluding couscous): 198 Calories; 7g Fat; 23g Protein; 12g Carbohydrate; 3g Dietary Fiber; 194mg Sodium.